There is a built-in support for zipping and unzipping files in OS X, and using it is fairly easy. Double-click to expand archived files; select files, right-click and choose ‘Compress’ to archive data. The problem is that the integrated tool does not support many formats, so if you have to work with a wider range of archive data, you are certainly better off with a third party software solutions. There are quite a few of them available in the market, so make sure to choose the one that suits your needs best. If you need a powerful, light-weight and fast tool, go for Commander One. This app does its job of expanding and compressing files really well, it is fast, reliable and supports a large number of formats – ZIP, 7zip, TarGz, TBZ, TGZ, tar.lzma, tar.xz and RAR. In a matter of a click extract data and create archives. There are two ways to compress data in Commander One. To do it in the default format, bring up the context menu for a file to be compressed and choose ‘Compress’. If you need an archive in another format, use ‘Compress’ command in the toolbar, here you can choose any of the supported formats, set a password protection and specify compression ratio. Note that archiving in RAR format is not supported at the moment, but Eltima Software, the app’s developer, assures that this feature will be added to the app as soon as possible. Commander One enables you to view archived data in a folder without extracting it, you can add files into the folder or remove some. In ZIP files you can search through their contents (for details on the powerful search feature see below). There is a number of customizable options in Commander One, and taking time to set them up is worth it, especially if you have to work with a lot of archived data rather often. The app’s functionality is easy-to-use thanks to the intuitive navigation and sleek interface. There is much more to Commander One. 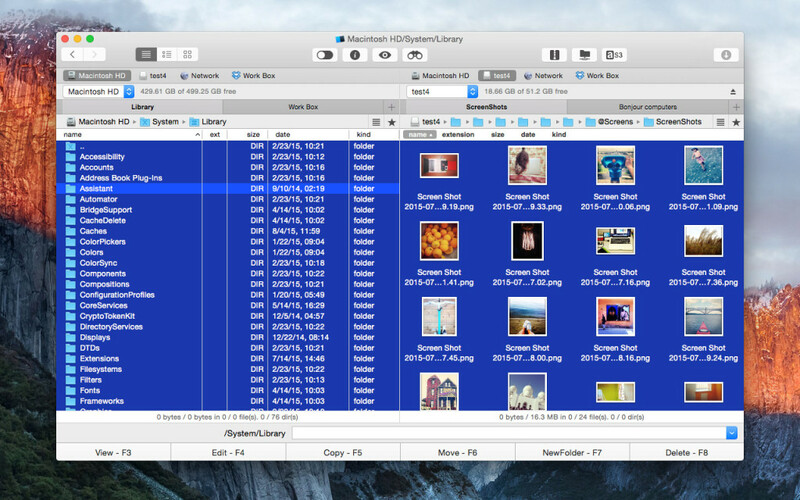 Apart from being an archive program for Mac, it also boasts functionality of a file manager. Many say that Commander One for Mac is what famous Total Commander is for Windows. The features are quite similar, and they both employ classic dual-pane UI that helps browsing and managing files and folders in an easy and efficient way. The app is equally good at performing basic as well as more advanced operations. You can copy-paste, move, delete, rename files and folders, queue these operations, assign them hotkeys, make use of History, Favorites and open any number of tabs for quicker navigation. Advanced functionality includes FTP, FTPS, SFTP Client to transfer files between computers and servers quickly, mounting devices and Dropbox accounts to access their contents easily and Dropbox account integration. Search feature is the app’s bonus, you can enter regular expressions for more accurate search, utilize integrated Spotlight search and search the contents of compressed files. The latest release of the application, Commander One 1.2 has migrated to Swift 2.0, thus adding to the stability and reliability of the app. It contains fixes and enhancements primarily targeted at the better compatibility with El Capitan, the new addition to OS X family. The new functionality enables accessing and managing contents of Amazon S3 online storage service, and mounting Google drive accounts so they appear as additional disks on your Macs. Make Commander One your choice #1.